The Pittsfield Historical Society is looking for someone interested in helping to design a new headquarters and museum. It would be wonderful if an architect would step forward, or someone with some experience in designing buildings. If interested, please contact Larry Berkson at 798-3984. Pittsfield Housing Standards has an opening for a member of their board. This member needs to be a landlord owning a residential rental property within the town of Pittsfield who is also a legal resident and a registered voter in the town of Pittsfield. If you have any questions, please call Kim at 435-6773 ext 21. The Friends of Josiah Carpenter Library will be holding a Used Book Sale in conjunction with the Town Wide Yard Sale on June 2, 2018. Please consider donating your used books to the library to add to the book sale. Donations can be dropped off at the library. Manchester, New Hampshire – June2-3 – On Saturday to Sunday, 10,000 participants will join together at the annual Relay For Life of Greater Concord Manchester at Livingston Park to help the American Cancer Society attack cancer from every angle. The event starts at 1pm to 5am. In addition to the support of the community, Relay For Life of Greater Concord Manchester is also supported by many local businesses and organizations. This year’s sponsors include: The Backroom, Margaritas, Dunkin Donuts and many more. Together, we can beat our biggest rival. Join or donate to the Relay For Life of Greater Concord manchester. Visit RelayForLife.org or Relayforlife.org/concordmanchester. 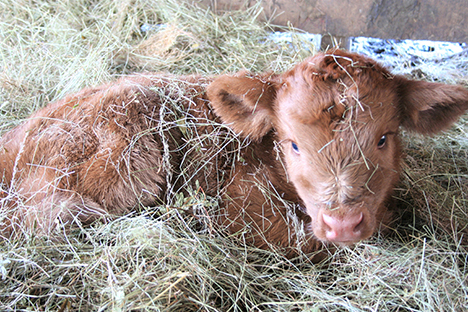 Bull calf born to Maya during the Spring Snowstorm on Monday, April 16. The calf tumbled over, head flopping as he attempted to get his legs under control. Blasting wind and horizontal rain was not going to stop this baby. Mother cow, Maya, chose the ravine behind the farmhouse to give birth. This was a sheltered spot to bear a calf but was far from the safety of the holding pen. Only nine of the ten cows in the “maternity” pasture showed up earlier that evening when we fed them hay… Maya was missing. Last week I was sure Spring had arrived; silly me! As I drove the ATV over green shoots of grass poking through an inch of snow and ice, it seemed that Winter had returned. My fingers were frozen. Icy rain pinched at my face and soaking wet I had to find a missing cow. When I located her, the calf had not yet been born, but I could see that Maya was in labor. Usually, a manageable cow that could change when a new-born calf appears. I was sure we could get Maya up the hill, past the feeding cows and into the holding pen before the birth, but if the calf were already born a simple job would become challenging. In the time it took me to drive the ATV down the hill to feed the pigs and locate help, the calf had been born. Friend Trish, husband Bruce and I perched on the steep hillside watching the calf struggle to stand as Maya licked and nuzzled encouragement. We were prepared to herd the cow, but the backbreaking task of carrying a new-born out of a slippery ravine with a possessive mother ready to attack seemed like a bad idea. We decided that Maya had made the right choice for a nursery. The spot she chose was out of the wind and cushioned with leaves. It was one of the few places in the pasture that was not snow-covered. In fact, two days earlier another cow named Sara, had chosen the same spot to have her calf. Sara was raised by a 4H'er and, unlike with Maya, we were able to lead her and the calf out of the ravine into the barn after giving birth. Over the years Maya had successfully raised five calves, so we decided to leave her and her new calf and check them in the morning. We now have seven of the anticipated seventeen calves as well as six piglets. Lucky, the sow, is fully recovered and her remaining six piglets are currently living on the heated porch with House Pig Tazzy. When Spring decides to arrive, we'll move the piglets to the barn, but for now, they are enjoying four-to-six feedings a day. Tazzy tolerates their squeals. When I'm feeding them, she'll nuzzle me as if to say, “Don't forget me, I'm a pig too!” I often see her sniffing around their cage, but she would never admit she likes them. Her name is ‘Tazzy Diva Moo,’ after all. After the storm passed on Tuesday, Maya herded her little calf out of the ravine to join the other cows and to eat a breakfast of hay. They made it through the storm without human help. I love smart cows that give birth on their own. Even though we were prepared to help, sometimes less is best. Carole Soule is co-owner of Miles Smith Farm, in Loudon, NH, where she raises and sells beef, pork, lamb, eggs and other local products. She can be reached at cas@milessmithfarm.com. Recycling plastic is not fantastic in today's rapidly changing economic market. China’s long-awaited awakening to the environmental impact on their country, has ceased their importing of other countries waste. This alarming impact is being felt on a universal scale not just at our local transfer station. The reality for us is that if we can’t market it, we can’t recycle it. Unlimited storage is not available as our permit specifies waste comes in, recyclables are sorted and then both are transferred out to their respective waste streams. We can strive for a cleaner sort of materials with your help. The cleaner the product equals the less contamination which relates to higher prices for our material when we put it out to bid. Ways you can help; remove and dispose of caps, rinse food residue from your containers, do not recycle containers that held toxic fluids such as motor oil and industrial cleaning products (i.e. drano, bleach, solvents). Jordan Gagan plays Buddy Baker and Ernie Bass is older brother Alan Baker. 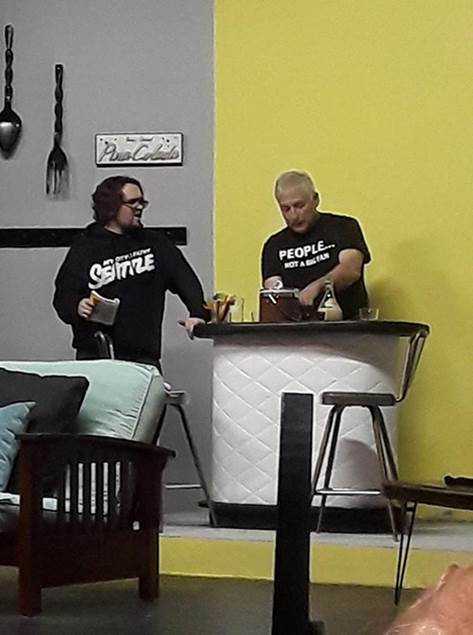 The two are at a crossroads in their lives and attempt to solve life’s little problems with a nightcap during The Pittsfield Players’ production of “Come Blow Your Horn” on May 4, 5 at 7:30 pm or May, 6 at 2 pm at the Scenic Theatre, home of The Pittsfield Players. “What do you want from my life?” yells Mrs. Baker, a.k.a. Mom played by Meggin Dail as she sits alone in her bachelor son’s apartment waiting for her other bachelor son to get her a taxi. All Mrs. Baker wants is for her family to be happy. What Alan wants is to keep playing the field. Buddy wants to be Alan and Mr Baker a.k.a. Harry or Dad, just wants his two sons to show up to work and for his wife to be home by dinner. Not too much to ask, really, until you throw Peggy and Connie into the mix. Peggy, the airhead, who lives upstairs only wants to be discovered and Connie, the nice girl, just wants to be married. Between the doorbell and the telephone, who knows how twisted the stories will get as Manheim, the fake producer dies suddenly. Meltzer, the big fake fruit account, has a surprise visit from his wife and Snow, the exchange student, creates an unnecessary flurry of activity. Marty Williams aptly portrays the ornery Harry Baker while Marty’s real life wife, Cathy Williams plays his soon-to-be daughter-in-law, Connie. Ernie Bass and Jordan Gagan play Alan and Buddy, Mr. Baker’s bums - er, sons and Alex Keyes is the beautiful, flirtatious rising star, Peggy. You’d be remiss if you didn’t meet the Bakers and Connie and Peggy on May 4, 5 at 7:30 PM or May 6 at 2PM at the Scenic Theatre, home of The Pittsfield Players, 6 Depot Street, Pittsfield, NH. Please come early as we can only hold reserved seats until 15 minute prior to show. Tickets, $15 can be purchased at the door or online through TicketLeap via www.pittsfieldplayers.com. For more information on the show, including “dinner and a show” tickets for Friday and Saturday night only in conjunction with Main Street Grill please call (603) 435-8852. Concord Regional VNA holds Loss After Addiction Drop-In Discussion Group, a new offering for anyone adjusting to the death of a loved one to addiction, on Wednesday, May 16 from 4 to 5:30 p.m. at Concord Regional VNA Hospice House, 240 Pleasant Street in Concord. Loss After Addiction is held on the third Wednesday of each month at the same time.